Literally soaked into the fabric of Japan’s cultural history, the art of indigo dyeing is as richly diverse and fascinating now as it was when it was first developed centuries ago. Although it is an ancient method, the process of aizome, or indigo dyeing, continues to have a deep influence and importance on fashion even today. In this guide to Japanese indigo dye, we’ll show you how it’s made, when it originated in Japan, why it’s important, and where to buy the best indigo dyed products! 2. How to Make Indigo Dye? 3. How to Use Indigo Dye? 4. Where to See Indigo Dyeing in Japan? 6. Where to Buy Indigo Dye Clothes? Although it’s considered to have its origins in India, the artisanal culture of indigo dyeing is deeply entrenched in Japanese craft, design and fashion. Today there are still local industries, like Kojima in Okayama, that exist primarily due to the culture of aizome and the production of indigo dye. Japanese people have used the dye for many centuries, although the widespread popularity of indigo dyeing can be traced back to the Edo era (1603-1868). During this time the country’s military leadership enacted various laws dictating the styles of clothing that Japanese people were allowed to wear. Elaborate colors were discouraged and luxurious fabrics were restricted to the upper classes. While elegant materials like silk were limited to the elite, simple indigo dyed items, in hemp or cotton, were some of the few bold colours that the common people were permitted. As a result, the deep blue of indigo clothing became the dominant uniform across the archipelago. In addition, the natural plant dye holds a number of almost magical yet widely acknowledged antibacterial, and dirt repelling qualities, which made it an indispensable tool both for the everyday Japanese worker, and for the warrior class of samurai. Over the decades the color indigo became synonymous with samurai culture. Under their armor samurai would wear indigo dyed garments as a way to protect their bodies from infection and help protect wounds. Firefighters would also wear indigo dyed clothes to take advantage of their flame retardant properties. Today the dye has become associated with ideologies of high quality and craftsmanship. The beauty and durability of Japanese indigo dye has made it inextricably linked to products from acclaimed Japanese denim to contemporary fashion. 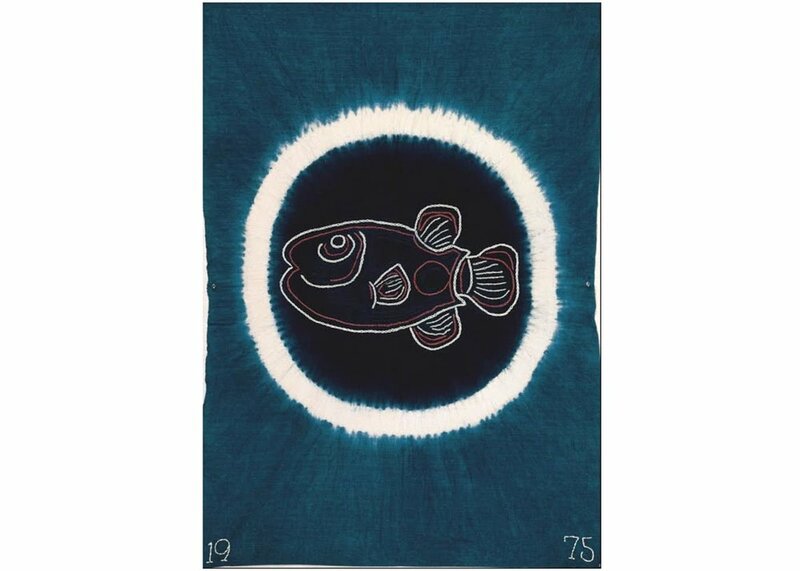 A creation as fascinating as it is beloved, there’s a lot more to indigo dye than meets the eye. The production of indigo dyed garments and other items can be separated in two stages; the creation of the dye, and the dyeing of the fabrics. To cover the process comprehensively we’ll start from the beginning; the extraction of the dye. The characteristic blue of the dye come from the leaves of the Japanese Indigo plant, Persicaria tinctoria. The plant’s leaves at first grow green and it generally takes about a year to get to the stage where they are able to produce the ink. Once the leaves are ready to harvest they are laid out to dry in the sun. During the drying period the true blue colour of the leaves starts to show, but this is just the beginning. Once dried it’s time for the leaves to be fermented. The process may differ depending on the techniques used, but essentially the fermented leaves must be tended to and moistened every three days to make what’s known as sukumo, the product which contains the dye solution. This sukumo is mixed with other substances like lime and lye before being fermented again and made into a dye that’s ready to use. Today a large percentage of sukumo is produced in Tokushima Prefecture in Shikoku. The actual process of dyeing a product varies greatly depending on a number of factors including; the product that’s being dyed, the depth of color needed and the techniques passed down by individual dyers. On first glance the solution of the indigo dye looks more black than blue, but once the fabric has absorbed the dye and is exposed to air it takes on the beautiful rich blue hue. The more times an item is dipped in dyed the deeper that blue becomes. Ryoya Takashima of vegan blog peacefulcuisine.com, explores the process of creating organic indigo dye in the video below! Japanese indigo dye is prized for both its visual beauty as well as its more practical qualities. The dye is used with clothing for both these reasons. Fashion designers and jean makers also love indigo dye because unlike cheaply produced chemical dyes, this natural plant dye gets better with age. Instead of fading out to a tired, worn-out look, indigo’s organic qualities mean that it ages like leather. The antibacterial quality of indigo also make it a unique foundation for skin and beauty products like soaps. An excellent example of some of the best indigo soap is Aizome Sekken a handmade soap crafted from the indigo-rich area of Tokushima. Essentially however the purposes of this dye are only limited by one’s imagination. Tokushima: Located on the southern island of Shikoku this prefecture is home to Wakimachi, a humble city that sits along the Yoshino River. During the Edo and Meiji periods, Wakimachi was known as the home of aizome. Even today Tokushima produces a large portion of the natural indigo used in Japanese dyeing. Walk along Udatsu Street in Wakimachi and you’ll find a number of extravagantly decorated merchant houses from the peak indigo dyeing period. To witness first hand the indigo dyeing process, visit Aizome Kobo, aka Higeta Indigo Dyeing Studio, a small studio which not only dyes clothing but is also involved in cotton cultivation, yarn making, yarn dyeing, and hand-weaving. Open: 8:30am - 5:00pm daily. Okayama: Kojima, a small town in Okayama, is today home to some of the most highly regarded manufacturers of denim jeans in the world. In fact the city is so synonymous with denim production that it’s home to Kojima Jeans Street, which as the name suggests is a street dedicated entirely to jeans. This renovated shopping district is home to jeans producers, dyers, cafes, denim lovers and practically everything a jeans fanatic could need. Address: Kojimaajino, Kurashiki City, Okayama. 15 minutes on foot from JR Kojima Sta. (see on Google Maps). Indigo dye has had a permanent and forever evolving influence on the modern fashion scene. To really understand its position in contemporary fashion, let’s take a quick look at two labels doing interesting work with natural dye. BEAUGAN: Founded by a Japan-based Australian, Christopher Hancy and now co-run alongside Miko Okumura, BEAUGAN is a label that’s both somehow modern, yet completely timeless. Their gender- and style-defying garments are all completely dyed by hand using the dorozome method, a type of natural mud-dyeing which dates back to Yayoi-era Japan. The ethics of the company are inspired by their admiration for the rustic, authentic workmanship of Japan’s artisans. In previous seasons the label has created a number of products utilizing the deep rich blue of antique Japanese indigo to create their striking garments. BUAISOU: This is almost more indigo label than fashion label. Based in Tokushima, BUAISOU grows and harvests their own indigo leaves and dyes the fabric on-site too. An all-in-house setup, the company creates and sells clothing, accessories, ceramics, and toys via their online store. If you’re in Japan and are looking to pick up a few pieces of indigo-dyed items, here are the stores you can’t miss. Okura: Located in the backstreets of Daikanyama, this elegant Japanese-style warehouse turned store is home to a broad selection of men’s and women’s clothing. Think kimono-inspired tops, rustic denim jeans and avantgarde designer pieces, and expect everything from the classic to the modern. Pure Blue Japan: As the name suggests, this inner-city outlet is passionately dedicated to indigo clothing. Shirts, jacket, jeans and everything in between it’s the ultimate home of denim in Tokyo. The store also has an outlet in Kojima, denim’s hometown. Aizenkobo Indigo Place: If you had to choose just one indigo dye related store in Kyoto to visit, make it this one. A store and workshop in one, it’s not only a great place to pick up beautiful gifts, but an educational experience and an opportunity to get a little hands-on and to learn more about the indigo dyeing experience. The owners of the store are very happy to chat about everything to do with aizome, and their unique products, so if you want to learn more about indigo dyeing, this is definitely the place to go!